The scorching weather prevailing over large parts of India has been setting new records on a daily basis. Yesterday saw Nasik in Maharashtra reach the hottest March temperature of 40.3 recorded previously about 40 years back. Banda in Uttar Pradesh, close to the MP border recorded 43.2°C making it the hottest March day ever for the town. Parts of West India though saw max temperatures slightly ease closer to the coast. As mentioned in our yesterday’s post the heat zone has been moving slowly in a West to East direction with parts of Uttar Pradesh coming under intense heat yesterday. Today it would be the turn of East India to come under the influence of this searing heat. 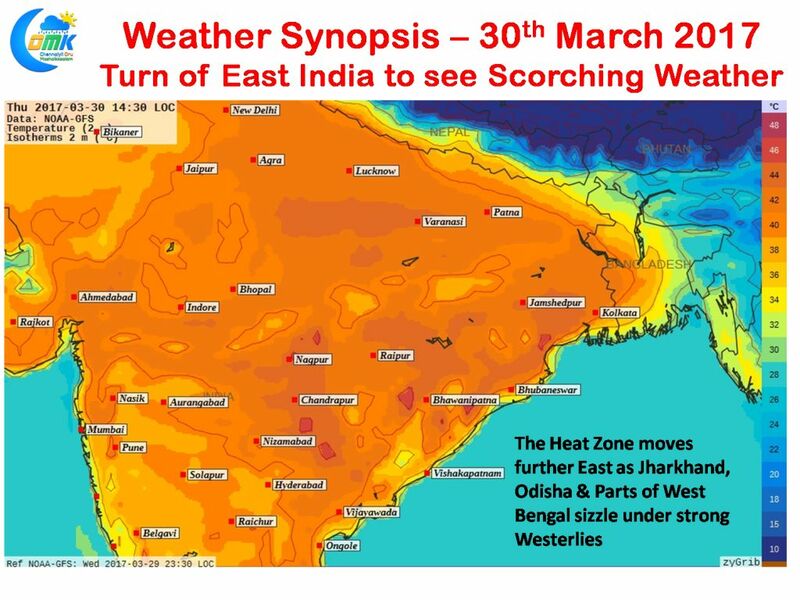 Places in Jharkhand could see scorching weather along with adjoining parts of Odisha and isolated places in West Bengal. With the dry continental Westerlies holding sway places above 17N latitude will continue to experience these searing heat wave conditions. Areas in the mining regions of Vidharba, Telengana, Odisha, Chhattisgarh & Jharkhand will see extreme heat during afternoon aggravated by local factors as well. There is a fair chance for places like Jamshedpur, Bankura to set new records for hottest day in March while Kolkata could come very close to its own record of about 40.6 in DumDum. Down South things are likely to be much more moderate particularly in Tamil Nadu, South Interior Karnataka & Kerala. 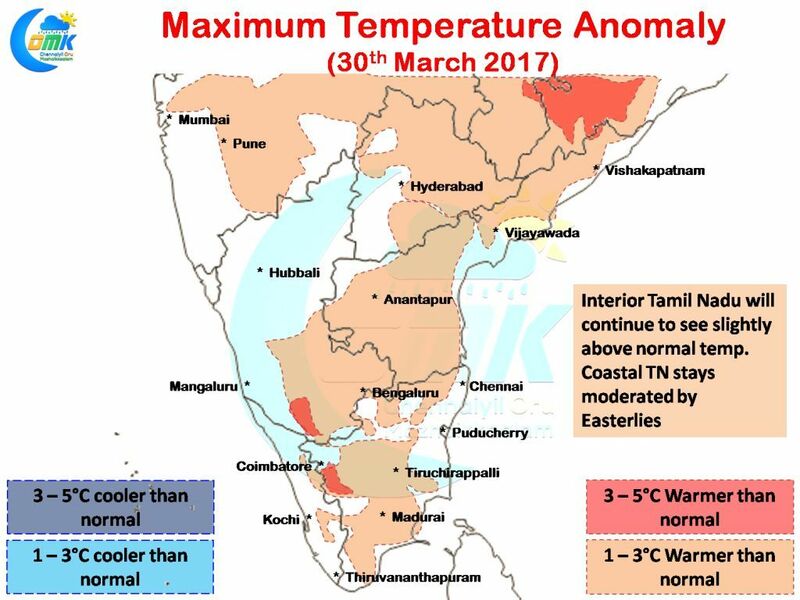 The interior places of Tamil Nadu will continue to see moderately hot conditions during day time while the coastal areas will continue to get benefitted from the Southerly / Easterly breeze tempering the day time conditions. Isolated places around Karur / Salem / Vellore & Trichy districts could see maximum temperatures top 40°C today.